I am sure you have already read my post about Confusion Fashion Accessories. with my favorite Net saree. 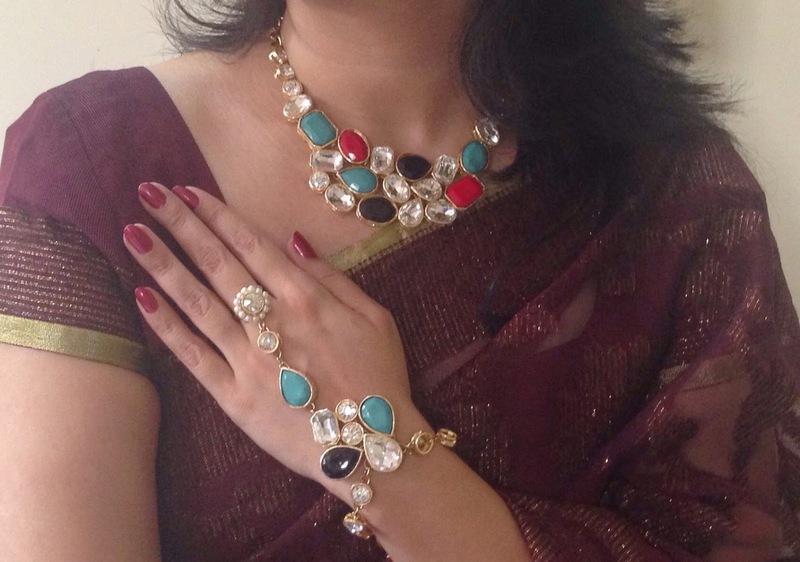 The end result..Overflowing compliments and inquiries about my jewellery. The Unique Crystal Necklace is made from Swarovski crystals put together in an abstract way to create a stunning piece. 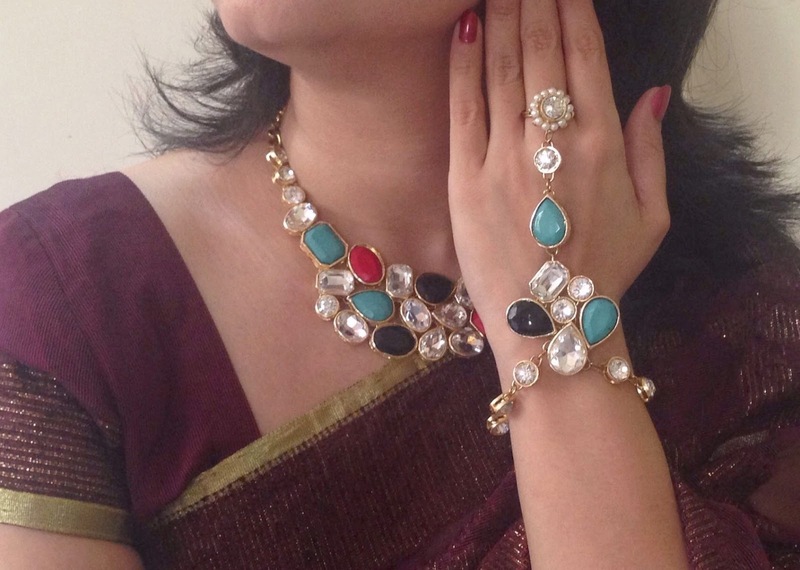 While the hand harness is made from a combination of stones in black and turquoise. These two pieces instantly added a royal touch to my look. Confusion Fashion Accessories offers a lifetime repair and service warranty on all necklaces!! Each product at Confusion FA is handcrafted with love and manufactured in India only. As a result they are able to fix and service your jewellery at any time. And now some good news for So-Saree Readers. 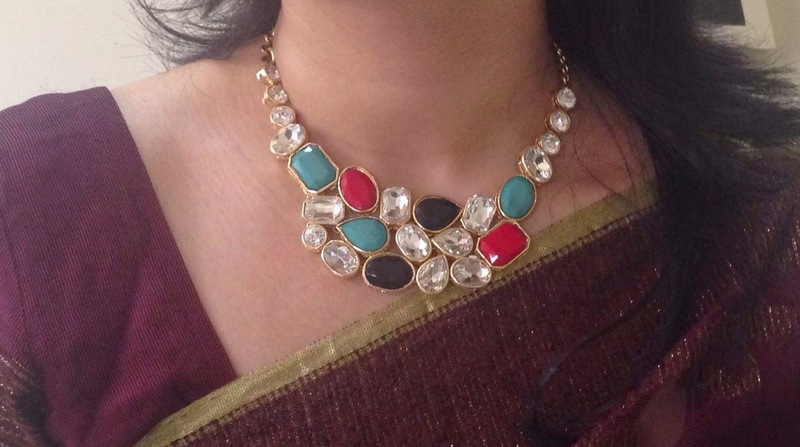 One Lucky Winner wins this statement necklace from Confusion FA worth Rs. 3150. 3> Share this giveaway on FB and Twitter as many times as you want. 1. Follow So-Saree on GFC. 2. Follow So-Saree on Google Plus. 3. Follow So-Saree on Bloglovin. Giveaway is open Internationally and closes on the 1st of May 2015. Winner will be announced a week later on the basis of a lucky draw. Done.. wish to be lucky..
Wow giveaway organize by u. lover of jewelry hope of wish to win this beautiful trendy, userfriendly, modern touch jewelry. done all steps dear thax a lot. Wow. This is super Awwwwwwesome..
Looooovvvee this neckpiece soooooo much..
Hope to win this as my bday gift..
Nice post.Love the jewelry with saree combination. I have shared the giveaway maximum number of times both on Twitter and Facebook & do it everyday. Please Notice my efforts as I am really giving my 200% to WIN this.. Thanks for this oppo, Aditi.